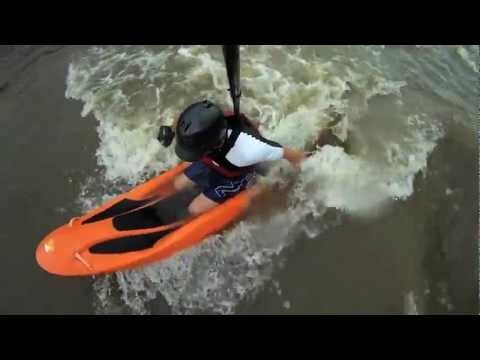 Part whitewater kayak, part riverboard, all fun. Handpaddle this bodyboat from your belly, knees or while seated. The largest craft in the Bellyak fleet, it's excellent for large paddlers or for smaller paddlers wanting a drier, super stable ride. A planning hull, defined chines and bow and stern rocker let you surf, squirt, blast and spin in water up to Class III. Single layer, rotomoulded polyethylene hull is self bailing. Shorter length lets you use your feet as rudders while surfing. Contoured deck area keeps you in control while surfing and resurfacing.